I was born and raised in Nebraska. Although I now live in Texas, I still root hard for the Cornhuskers, especially the football team (and I teach my daughters to do the same). This article for Religion and Politics takes a look at the ways in which football and religion are intertwined in my home state. You can read the intro below. Click here if you want to read the rest. My childhood was oriented around Nebraska Cornhusker football. A pastor’s kid growing up in McCook, a town of 8,000 in southwest Nebraska, I came of age during the Cornhuskers’ string of championship runs in the 1990s. I was more likely to skip church on Sunday than miss the Saturday radio or television broadcast of the Cornhusker game. Occasionally I scored tickets to see the action in person. 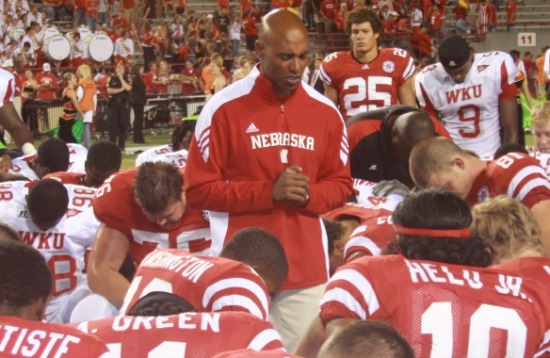 I have vivid memories of the four-hour pilgrimage east to Memorial Stadium in Lincoln, where I joined fellow Huskers as we sang hymns like “Dear Old Nebraska U,” chanted “Husker Power!” and participated in the call-and-response liturgy of “throwing the bones” (crossing our arms into an X) after a spectacular defensive play. Not everyone in Nebraska roots for Cornhusker football, but nothing else unites the state quite as much. Even for dissenters, the power of the Big Red cannot be avoided. Fall weddings must be planned around football games; trips out in public on game day must be taken with the assumption that the radio broadcast will be piped through the speakers of whatever establishment you are visiting. It is no wonder that scholars have found Cornhusker fans useful when exploring the “sports-as-religion” thesis. Historical Reflections on Brian Smith's "The Assist"
Last weekend while visiting my home state of Nebraska, I ran into my old high school basketball coach. He was the leader of my school's Fellowship of Christian Athletes (FCA) huddle group, and is still involved in FCA. Although it's been fifteen years since I played for him, we still keep in touch. In fact, I have it on good authority that he reads this website from time to time (what's up, coach?). 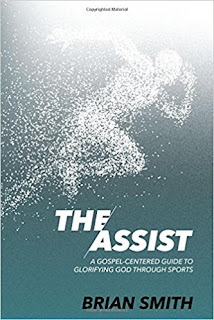 I bring up my former coach because when I read books geared towards sports and Christian living, I often think of him. These books are not written primarily for me, a historian who is not actively engaged in organized athletic competition or sports ministry. They are written for my high school basketball coach and the Christian athletes who play for him. 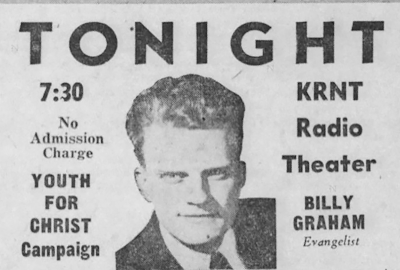 Early in his evangelistic career, Billy Graham had a sermon in his repertoire based on Ernest Lawrence Thayer’s classic baseball poem “Casey at the Bat.” Delivered in the 1940s and 1950s, it was geared towards a Cold War age of atomic anxiety. The threat of nuclear warfare loomed; God’s judgment was at hand; America was like mighty Casey with two strikes against her. "Some of us have struck once, some twice. But you'll all, every last one of you, strike out when the Great Umpire of the Ages calls the balls and strikes," Graham warned his listeners. "The count is three and two, the next pitch is the last one. Decide now, before it's too late." On July 21 Netflix released Season 2 of Last Chance U, which documents the 2016 football season at East Mississippi Community College. Since you clicked on this post, I'm going to assume that you are familiar with Last Chance U's basic storyline--if not, this piece provides a nice introduction to the series. On Season 1 of Last Chance U, it quickly became apparent that the Lord's Prayer was routine and familiar for members of the East Mississippi Community College football team. "Everybody touch somebody," head coach Buddy Stephens would say. 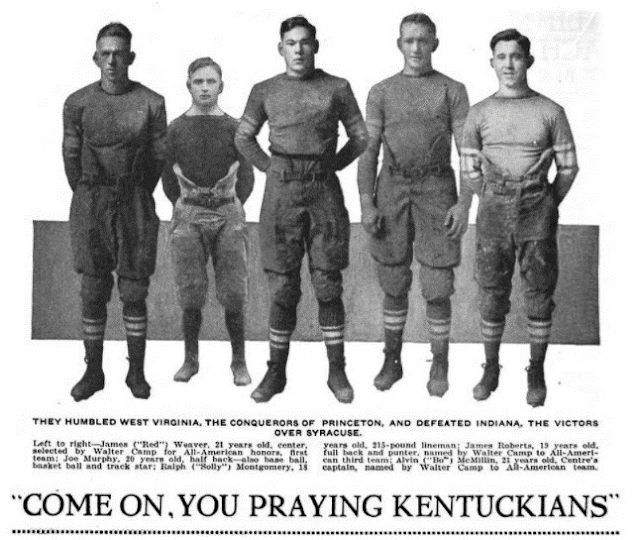 Then, players' heads bowed, the words came tumbling out: "Our father who art in heaven...."